There is no doubt about it, “I Want to Take You Higher” is the best exercise song ever. At five minutes and twenty seconds of driving beat that never wants to end, hammering home the point and impelling uncontrollable movement. I’m exhausted just writing about it. While exercising to Sly and the Family Stone for the umpteenth time with their message of believing in yourself, and generally just going back to those days in my mind, I thought of a time when my brother and I were visiting my father in New Jersey, where the divorced fathers of New York seemed to have been banished to. We were spending the day at his then girlfriend Lil’s house. I remember liking Lil, but not really knowing her. Her daughter, though she may have been about twice my young age, didn’t strike my as an adult with her short bleached hair, gobs of eye make-up and mod little mini-dress trying to emulate ‘60s model Twiggy. And her recent college grad boyfriend in his suit and tie who seemed to have already made an impression on my father and joked with him that there were no vice president jobs in the paper. I think the reason I was not comfortable with the couple was that they did not seem genuine and struck me as bratty. If I knew better at the time I may have described them as opportunistic. I didn’t really warm up to them. After dinner, we watched the 1949 Spencer Tracy/Katherine Hepburn classic Adam’s Rib and the conversation turned to how a woman couldn’t be president. In a room of six, I, who had not even crossed into the double digits age-wise, was the only one questioning why not. Lil, seeing my frustration, gently smiled at me and assured me the others were right. Thank god, or whoever, for Mrs. Peel. She was my hero. Someone at that time that I could really look up to. Emma Peel, as played by the phenomenal Diana Rigg, was the semi-bohemian super spy on the mid to late 1960s British TV show The Avengers, and was every bit the equal of her male counterpart John Steed. Mrs. Peel, who by the way, was to be originally played by Eleanor Bron, was the coolest of cool in her catsuits that made her look more unconventional than voluptuous. She had no fears, but was healthily dubious of pain, could flip two guys at one time without breaking a sweat, and was just beautiful. She, and to a lesser extent, America’s Honey West who had a pet ocelot named Bruce and was played by the perfectly formed Anne Francis, were major influences on me and perhaps made me strive to be a stronger person and more independent female. Would I have been such a strong willed little girl who felt there was something wrong with thinking that girls were inferior to boys, women to men, if it hadn’t been for the likes of them? And then, Diana Rigg left her successful role, woefully so for me, to do Shakespeare. I admire people who go after their passions even if it means putting a sure thing aside. Though I don’t know if she met with the success she had back then again, I’ve seen her in other things over the decades, but a couple of years ago when I was about to give up my premium cable channels, I stopped on one to see what this Games of Thrones thing was all about. I just happened to catch a scene with an old woman and immediately recognized by voice and then by face that it was my old mentor Diana Rigg, who at the age of 76 plays Lady Olenna Tyrell. And so we go from Game of Thrones to “Cynthia on the throne,” which is the line from “Dance to the Music” that introduces the horn section. It’s the line that my city cousin and I, and I’m sure many others thought was “Cynthia on the drums,” as it sounds, but never made any sense. There was that aha moment when I learned, after all this time, what Sly sang, and understand why. 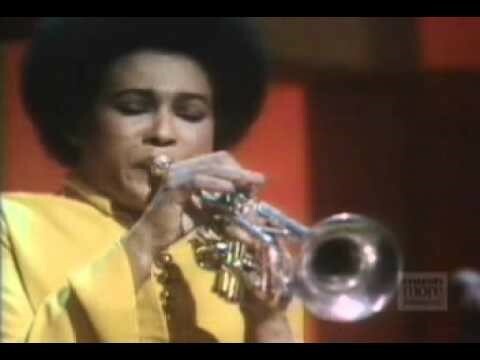 When I wrote the post on Sly and the Family Stone at the end of December, I noted how trumpeter Cynthia Robinson had made a big impression on me in the late ‘60s. I thought she must be one tough chick, taking on a guy’s role and shouting at us in her ballsy, gritty voice to “get on up and dance to the music” or playing her solo in “I Want to Take You Higher.” Of course, like many of us, she says she was shy, but she had a passion and a goal. In high school, she says, she wanted to play the flute, but there were none available and the clarinet didn’t appeal to her. She saw some guy playing the trumpet and fascinated by what she saw and heard asked him if she could try it, and that led to her status as legendary trumpeter. Much of this is chronicled in a 2013 interview with Robinson in Rookie magazine at http://www.rookiemag.com/2013/08/cynthia-sly-and-family-stone/, in which she discusses her struggles with being accepted as a musician. There’s also a great early, pre-fro picture of Sly and Cynthia that accompanies the article. As for a woman not being able to be president, not only may I be around to see that in my lifetime, I think history has proven that it is men who can’t be president. Or maybe just shouldn’t. And I’m being bipartisan here. And while I’m mentioning Diana Rigg/Emma Peel, Honey West and Cynthia Robinson as positive female role models of my childhood, I should throw in Bonnie Raitt and her slide guitar, and astronaut Sally Ride, whom I may just write about some day soon. And be prepared for more Sly, cause I am now obsessed. ← January 28 – Snow Day!